Araby has lived the last couple of years of her life in a drug induced stupor, spending her evenings with her friend, April, at the Debauchery Club, a private club where you go to forget the outside world. And what's wrong with the outside world? First off is the plague called the Weeping Sickness, a silent killer that seems to eat away at a body until death. Secondly, Araby is trying to forget the death of her twin brother, Finn, whose death she feels responsible for due to an innocent mistake, and as a result, she has set herself with a promise to him, that she won't enjoy anything in life that he won't now be able to enjoy, which includes falling in love. Araby's father invented a mask that can keep the wearer safe from the Weeping Sickness, but instead of making the mask available to all, Prince Prospero has turned the manufacture of the masks into a profitable venture, thereby preventing the lower classes from being able to afford masks and being at the mercy of the plague. Because of his invention, however, Araby's father and his family has been able to live in relative opulence, something else Araby carries guilt over. Quite frankly, felt there was a little too much guilt-ridden Araby going on in this book. Don't get me wrong, she's a fine MC, but I'll admit, I found April a sometimes more compelling character than Araby - I'd really like to see a story from April's POV sometime. Araby eventually catches the eye of both Will, a bouncer at the Debauchery Club, and Elliott, April's older brother, each of whom are interested in Araby for far different reasons. Will sees her as a lost soul, someone that he would like to see rise above her self-imposed vow and begin to enjoy life again. Elliott wants to use her for far more seemly nefarious reasons, and while she doesn't entirely trust Elliott, she decides to help him. Enter the love triangle and most of the emotional impetus that is used on Araby for the majority of the second half of the book. 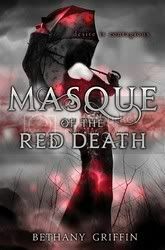 I've read in several places that Bethany Griffin's Masque of the Red Death is a retelling of Poe's classic tale of the same name, but I can't help but keep thinking of it as a prequel of sorts to Poe's story. Maybe it's just me, but Griffin's story seemed to be leading up to the events of Poe's, putting all the key elements of her story in place to get the key characters in Poe's story into their necessary places for his story. However you want to interpret Griffin's Masque, I recommend reading it. Griffin has created a very unique world, that somehow feels eerily familiar at the same time. The book is not really uplifting; the Weeping Sickness is very real in this world, and people die, frequently, from it. The one thing that Griffin does successfully in this book is create an atmosphere that is practically palpable. The feel of the crumbling city, the despair, the feeling of hopelessness is so well presented, as a reader, I felt a real creepiness from reading the book. However, the book carries, quite obviously, a lot of the tropes of current YA books, but still manages to tell a story that is unique unto itself. I just wish those tropes weren't always so obvious. Jade loves the house she's just moved into with her family. She doesn't even mind being the new girl at the high school: It's a fresh start, and there's that one guy with the dreamy blue eyes. . . . But then things begin happening. Strange, otherworldly things. Jade's little brother claims to see a glimmering girl in his room. Jade's jewelry gets moved around, as if by an invisible hand. Kids at school whisper behind her back like they know something she doesn't. Soon, Jade must face an impossible fact: that her perfect house is haunted. Haunted by a ghost who's seeking not just vengeance, but the truth. The ghost of a girl who ruled Jade's school -- until her untimely death last year. It's up to Jade to put the pieces together before her own life is at stake. As Jade investigates the mystery, she discovers that her new friends in town have more than a few deep, dark secrets. But is one of them a murderer? Sounds like a great book, and it's a standalone story, which I'm quite frankly rather happy about. I'm just a little in series overload, so having a nice tidy, wrapped-up-in-one-book story really appeals to me. And that cover... I just love it! I can't wait to pick this one up. 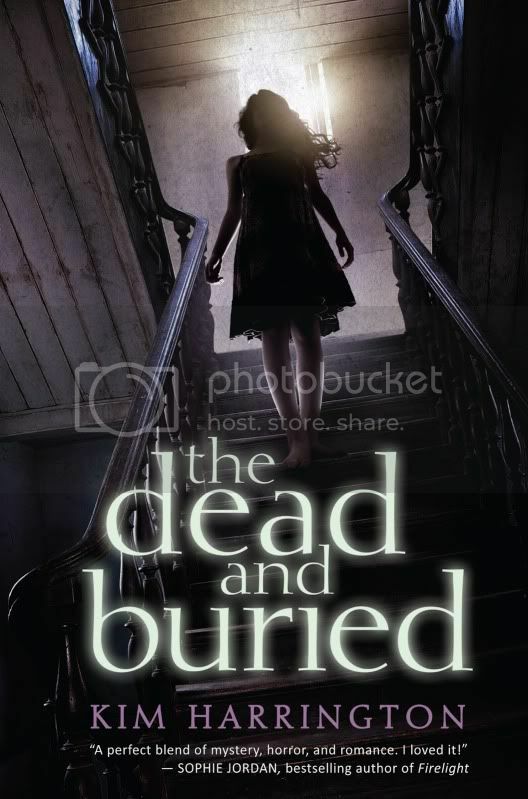 The Dead and Buried will be released in January of 2013 from Scholastic/Point. I read this book, the companion to Powers' The Stress of Her Regard, much more slowly than I expected to. I don't think it was the book's fault, but rather a case of poor timing on my part, but I will say that I was not pulled in to this novel as quickly or as fully as I was with the first. Part of the issue is that any reader who has read the first novel recently (as I have) knows exactly what's going on, which means that this book is much more about characters and interactions than it is about the mystery of the Nephilim, so one doesn't feel as compelled by the sense of wonder and intrigue that characterized the previous experience. Fortunately, Powers writes great characters. While his characterizations of famous literary figures -- the Rosettis, Swinburne, Trelawney -- are fascinating and genuine, Powers gives us other obscure or fictional characters who really become the focus of the readers' bond in this story. Crawford and McKee are such marvelously ordinary, good but flawed people that one cannot help but feel connected. While the icons of literature are idiosyncratically fun, Crawford -- with his reluctant heroics and authentic reactions -- is a man we could spend time with. Similarly, McKee and Johanna act almost as a bridge between the ordinary and the extraordinary, making the strange twists and supernatural conflicts of the novel seem oddly plausible. Lest you be discouraged by all this talk of the ordinary, you should be aware that this is still a Tim Powers novel. As is typical, it covers unexpectedly large swathes of time and involves any number of fantastic adventures that occur at a generally unrelenting pace. This novel does not gallivant across the European continent in the way its predecessor did; it has a very strong sense of place, centered on London, and uses the character of the city in wonderful ways. 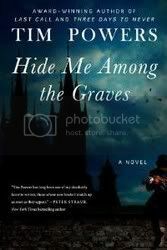 The tone of the novel leans solidly into horror -- there are quite a few adventures into dark places and ending in dark deaths, and the title accurately indicates the ghostly atmosphere -- but there is nothing here that seems gratuitously violent or idly inflammatory. The entire book is tightly planned; Powers even seems to have trimmed some of his tendency toward over-indulgent description, which I sometimes missed. I do love an indulgence. The overall result is probably one of Powers' most balanced and most marketable books. Thoroughly enjoyable, with rich intellectual and emotional presence, the novel curls and careers down fascinating paths without making the reader feel overwhelmed. While a part of me misses that occasional sense of "WTF?" which characterized other Tim Powers reading experiences, I appreciated the elegant lines of this story. Highly recommended for fans of historical fantasy, historical fiction, dark fantasy or just Very Good Books. 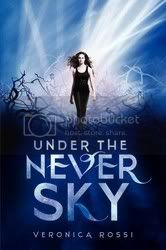 Veronica Rossi's Under the Never Sky is one of the latest "trendy" dystopian books to be hitting the YA market these days, but don't let that dissuade you from trying it out. It has all the familiar flavors: beautiful girl (Aria) discovers that even though her world is literally falling apart around her, there may be more to what she believes as the norm; she finds herself in a situation that pits her against the reigning governmental body; enter the hot guy (Perry) that will help her, reluctantly in this case, overcome all her obstacles; she may or may not fall hard for said hot guy, in the middle of trying to save the world/her family/herself; vague, cliffhanger-ish ending. What Rossi does do is whip all these familiar ingredients into something that, to me at least, felt fresh and new. Aria's world is split into two distinct locales. There are the enclosed domes where Aria lives, where everything is controlled and there are no diseases and everyone is plugged into the Realms, virtual reality worlds that are supposedly more real than reality. Then there is the outside, where nature runs its course, and people live off the land and where some people have even developed more heightened senses to help them survive. When Aria finds herself in the wrong place at the wrong time, she is exiled into the outside, or Death Shop, where she expects to die instantly from any number of diseases that she has been protected from by living in the dome. When she doesn't die from exposure, she is sure that she will die from the unpredictable, wild electrical storms that ravage the land, but is rescued by Perry. After they are thrust into a situation where they reluctantly need each others help, they begin to learn more about each other and begin to realize that they may have more in common than they ever expected. I really liked the back and forth point of view shifts from Aria and Perry. Each chapter was told from one of their perspectives, and that made it nice to see the world as each of them saw it, and also how they looked at and thought about each other. I think this is one of the things that helps this book; so many of these books are told from just the female protagonists point of view lately, it was actually a fresh take to see it come from his point of view as well. Rossi's worldbuilding, I felt, was strong enough to not require a lot of unnecessary explanation. The only thing that is more or less left for the reader to just accept as is are the electrical storms and aether. There isn't much in the way of any explanation as to what either these storms are or what they are composed of; however, I think this will probably be something that will be explained in one of the later books, as this is the first part of another trilogy. This is actually the only drawback for me on this book. Enough of the trilogies already! I'm on series overload. I'd really like one of these recent YA stories to be nothing more than a nice, little self-contained story, thankyouverymuch. That aside, Rossi is a strong storyteller and of course I'll be there, picking up the next book in the series when it is released next year.